The Sprinter Van carries up to the 2.5 ton Packages. For safety and speed, it has a leveling lift gate rated at 1,100lbs. The lift gate has enabled us to add large carts to the package. 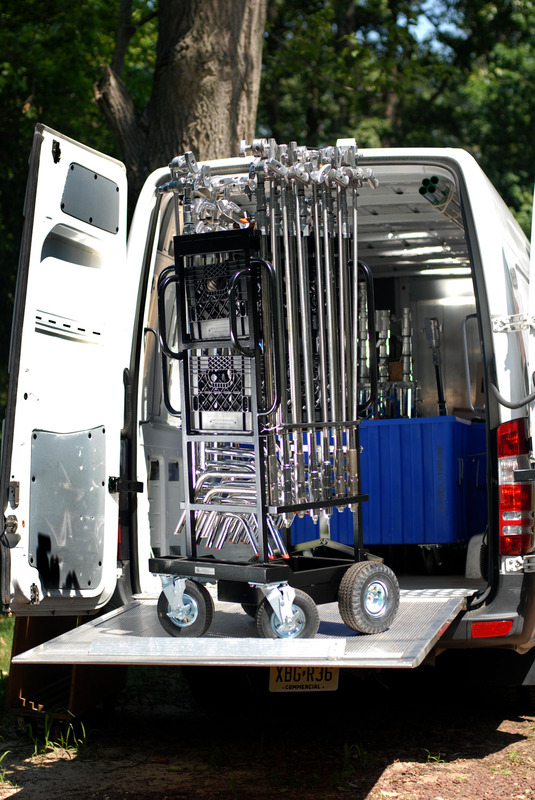 4x4 cart, 12 C-stand cart and 800lb sandbag cart are a must on any job. They roll off the gate in into staging very quickly. Most importantly, the lift gate reduces crew bitching by 83.6%. For add-ons to the packages see the À La Carte page. Drivers get 1 hr. (straight or less) drive time each way. Millage is at .65/mile. Expendables are priced per use. If the production supplies it's own Expendables, please let us know, so we don't get them mixed up! ALL discounts are based on 30 days. Invoices paid after 30 days will lose any discounts.